The emergence of popular new white wine grape varieties and wine styles since the Anything But Chardonnay melt-down at the turn of the millennium has been relentless. Everything from Viognier to Grüner-Veltliner to Picpoul has been declared as the ‘next big thing’, without always acheiving the sustained level of popularity that was predicted. One star that rose, and sees no sign of falling again, is Albariño. The once niche grape variety of north-western Spain (and Portugal, where it is known as Alvarinho), Albariño has suddenly become the white wine that’s seemingly on everyone’s lips, quite literally, to become the crisp, cool, fish- and seafood-friendly first choice for many wine drinkers. The Spanish homeland of Albariño is Rías Baixas, a sub-region of Galicia, the Atlantic-influenced cool and green region of Spain that sits due north of Portugal. As with so much of Europe, the Romans occupied Galicia and brought viticulture and winemaking with them, followed by Cistercian monks from France in the 12th century with their winemaking prowess, Galician wine flourishing until trade wars and Phylloxera devastated this area at the end of the 19th century. As replanting eventually resumed in the early 20th century, Albariño began to emerge as the region’s star. Just like the Vinho Verde producing region of Portugal, which sits directly across the Minho River, many of the vineyards here were trained on high ‘pergola’ systems, the airflow giving some protection against mildew in this often damp climate, and often allowing a second crop to be grown below by smallholder farmers. For quality and yield control, many top vineyards have been re-planted and re-trained on espaldera (double cordon) or other, lower, trellising systems. That is certainly the case for Lagar de Cervera, one of the star names of the Rías Baixas region, and owned by La Rioja Alta of Rioja. 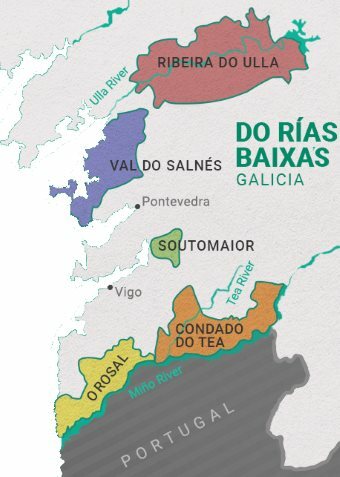 Lagar de Cervera is based in the O Rosal, one of the most southerly of Rías Baixas’ five sub-regions (map courtesy riasbaixaswines.com). O Rosal is coastal and cool with an array of hillside and terraced vineyards, those of Lagar de Cervera pieced together over 15 years, parcel by parcel, and trained on wires. Soils of the region are granite, with patches of slate. In the winery, gentle treatment with pneumatic presses and cool fermentation in stainless steel tanks is the order of the day – though I spy one concrete ‘egg’, “for experimentation – it’s our first year,” says Ángel (left). In tank, the lees are kept in suspension by nitrogen, which allows Angel to use lower levels of sulphur dioxide because proteins in yeast protect against oxidation. From pressing to bottling takes six months in theory, though Ángel prefers to maintain his wines in chilled tanks, and bottle as needed for the market. 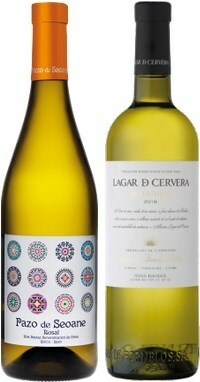 Around 250,000 bottles of Lagar de Cervera Albariño are produced anually, with a further 150,000 bottles of Pazo de Seoane, a second wine that blends Albariño with Loureiro, Caiño Blanco and Treixadura. For the UK market all wines are bottled under screwcap. 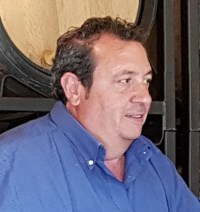 Ángel talks of the ‘boom’ in Albariño around 35 years ago, which led to some less good clones being planted, so the region is evolving and focusing more and more on quality. There are 4,000 hectares of vines in Rías Baixas, 400 of those in O Rosal, but with 65 ha of its own, Lagar de Cervera is a major player for the sub-region. Its Albariño has been a staple of mine for many years, the first note you will find in my database here on wine-pages dating from 1997. It is a wine of very high and consistent quality. Rías Baixas wines are riding the crest of a wave currently, and at dinner after my visit, eating wonderful Galician seafood, the match was pretty much made in heaven. Lagar de Cervera is imported into the UK by Armit Wines. (2018) This wine is not currently retailed in the UK, but its price appears to be very similar to the straight Albariño. It is a blend of 68% Albariño with Treixadura, Caiño and Loureiro. Hinting at tropical fruit and honeysuckle on the nose, there are floral notes too, it seems ripe and sweetly vibrant. A passion fruit note continues onto the palate, before being tensioned by its lemon and lime juice acid backbone.